VIVOTEK VS7100 is a professional 1-CH video server for remote surveillance. 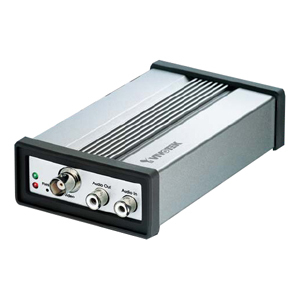 Embedded with VIVOTEK's VVTK 1000 SoC, it not only provides dual-codec video compression in MPEG-4 and MJPEG formats to efficiently optimize image quality and bandwidth, but also can simultaneously deliver dual streams with different resolutions up to D1 and video quality upon separate devices. Users can easily migrate to an IP-based digital open system from the existing analog close system and meet different requirements for live viewing and recording. VIVOTEK VS7100 also comes with versatile functions to meet specific applications such as 3GPP mobile surveillance, digital I/O for external sensor and alarm, RS-485 interface for PTZ camera control, and privacy masks and so on.